9 The Twelve Days of Christmas - I picked up this vintage beauty last year, a beauty. 10 The Velveteen Rabbit - This version I found at a thrift store, but we used to read this around Christmas time and also listen to the Meryl Streep Narration , she reads it so beautifully. 11 Bear Noel - A winter story about animals in the woods awaiting Bear Noel. 12 Olive, the other Reindeer - Had to throw another comical one in here. 13 Silver Packages - A title we loved to read growing up, reflects upon kindness and love. 14 The Little Fir Tree - The old-fashioned charm of this one is delightful. 15 The Nutcracker - Love the Susan Jeffers illustrations of this version. 16 The Polar Express - Classic, we used to read this by flashlight around the train and tree. 17 A Christmas Story - The illustrations of this one are gorgeous, with lots of pretty gold! 18 Pashmina The Little Christmas Goat - This touching story is about how sacrifice can lead to great happiness, and I am drawn into the beautiful fresh watercolor art as well. 19 Federico and the Magi's Gift - A library pick, I enjoy the Latin tradition of the Wise Men delivering gifts post Christmas. 20 Stopping by Woods on a Snowy Evening - Incorporating poetry like Robert Frost into the mix seemed like a nice touch. Another pretty Susan Jeffers. 21 Over and Under The Snow - A ski trip through the woods, a more wintery choice. 22 The Gift of the Magi - Such a fan of this classic and there are many lovely versions. 23 The Christmas Magic - Gorgeous art, has a European feel. 24 The Third Gift - This new release (came out this year) explains what myrrh is through the eyes of a young boy. The illustrations of the book remind me so much of the Middle East. 25 Christmas Day in the Morning - written by Pearl S. Buck a lovely story about a father and son's love. Many of these titles I got from the library, so I am sure our list will continue to evolve in the future. 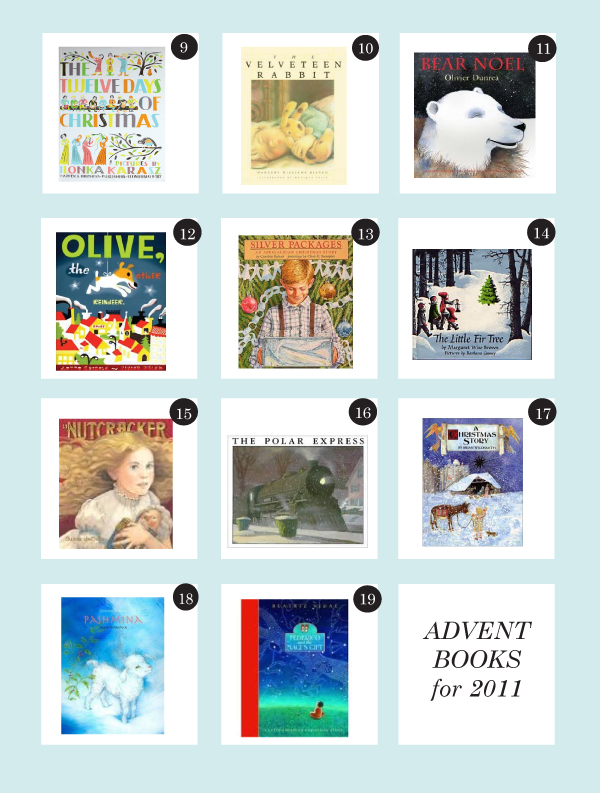 Have you ever tried an Advent Book countdown? So far it has been such a fun new tradition, our girls really adore and look forward to curling up for a nice read each evening. Shout out your Christmas and winter favorites! Some of those I remember reading was a little kid, and I have read them to my daughters. Books make for great gifts because you can pass them down from generation to generation! 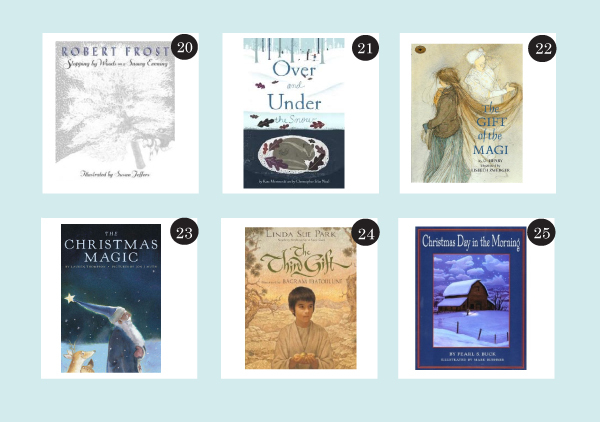 I love Christmas books- some great ones on here that I read as a child! Must refresh my collection! I love these christmas books lists! Thank you for sharing your picks! you need to put The Snowman on there! its british. great choices. another classic at my house growing up was 'The Mitten.' the illustrations are beautiful! This is such a great idea, Rachel! Merry Christmas!